& on all digital stores worldwide. "Clifford Slapper has been playing David Bowie music for many years in England. He has accompanied many singers doing David Bowie music. His love for his music is very obvious. His new CD, with many excellent singers each singing one of David’s songs, is very potent. 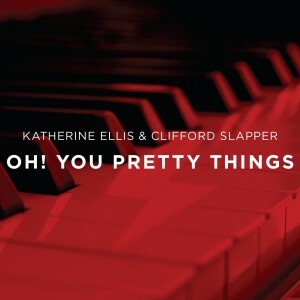 Cliff plays very well, and it is a heartfelt recording." Harry Maslin, producer of David Bowie's Station To Station album (including original recording of "Stay") & producer of David Bowie's #1 USA hit "Fame", says: "Clifford Slapper, a stellar pianist and long time contributor to the perpetuation of the music of David Bowie, has created an album of Bowie music that is meant to focus the listener primarily on the lyric or poetry of the original songs, to give the Bowie fan a new vision of some of his masterpieces. 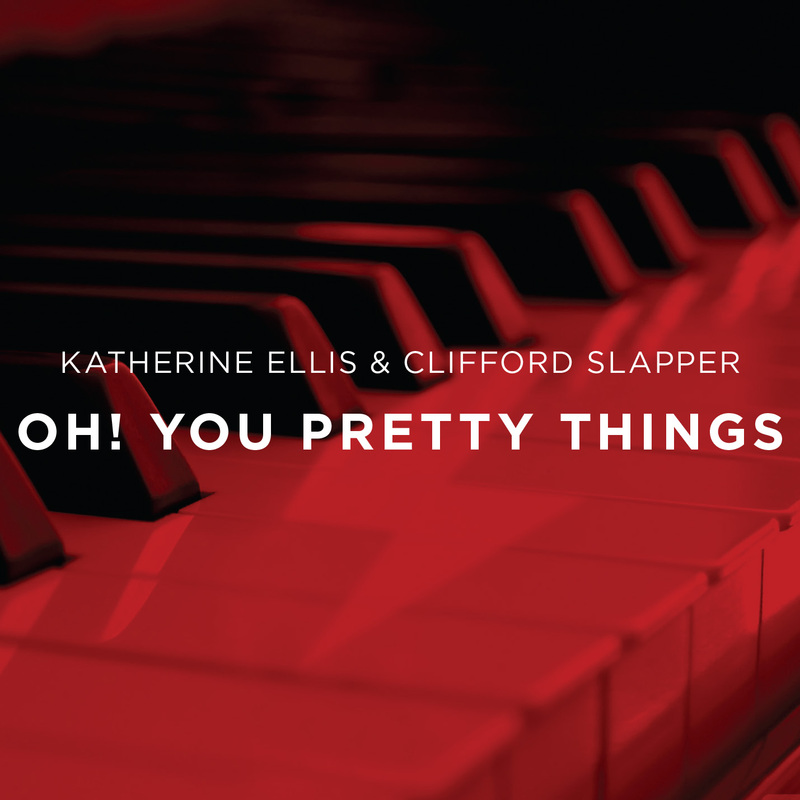 I thoroughly enjoyed listening to Clifford and his friends, and I am pleased to have added his CD to my personal collection." 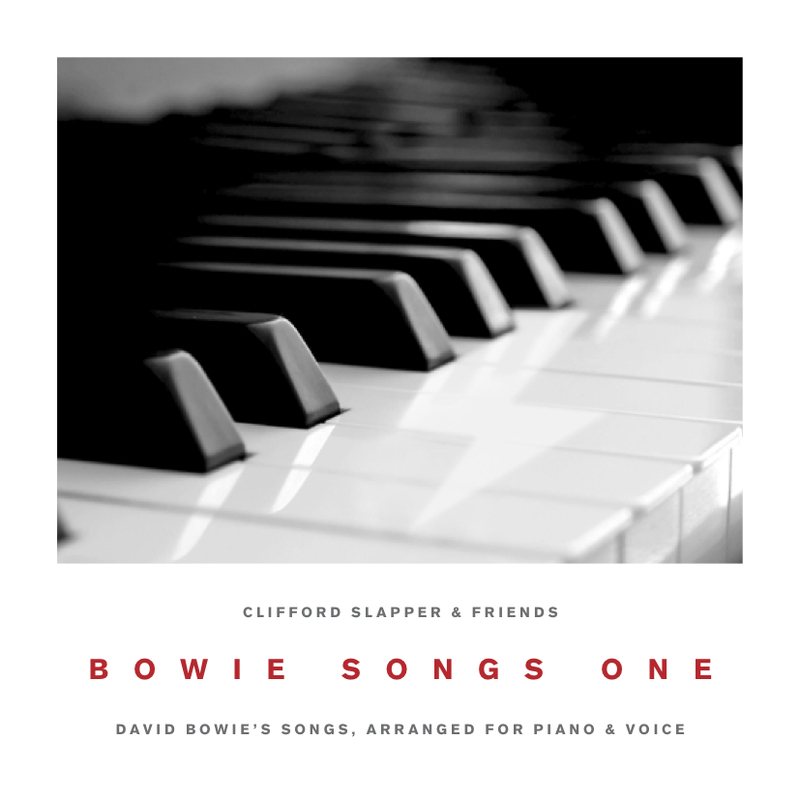 BOWIE SONGS ONE - a new album, with some magical new interpretations of songs by David Bowie, with piano by Clifford Slapper and vocals from some of the most stunning voices around. The background to this very special release is told below. BOWIESONGS1 - an album of some of David Bowie's masterpiece songs performed completely unplugged, purely voice & piano. All of these great singers have got to the emotional heart of each song, in the most moving way. We have been working on this for over a year. Several of the songs were already recorded before we were hit by the shocking news of David Bowie's passing in January of this year. It was always a labour of love from a life-long fan and fellow enthusiasts, but it is now also an homage to a lost hero. 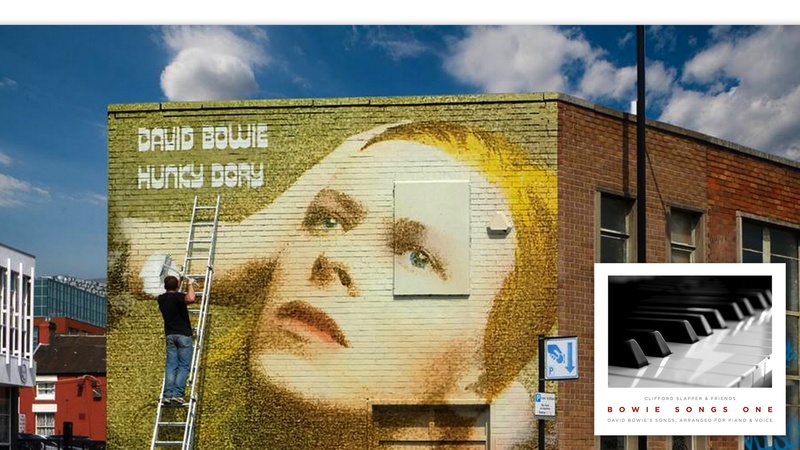 Unlike other albums of Bowie songs this is pure, unplugged, acoustic - and very powerful. 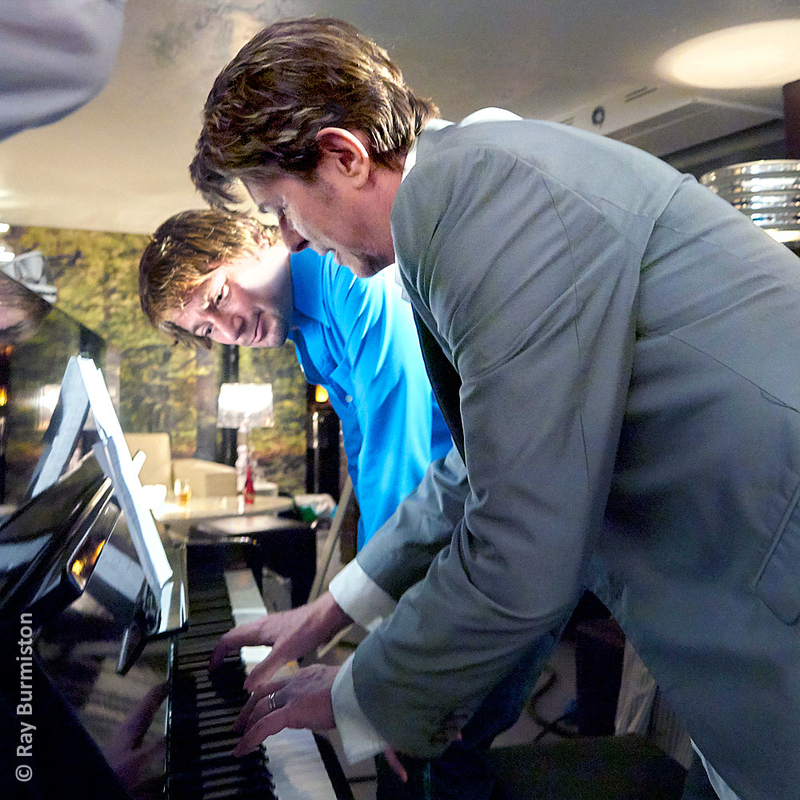 Clifford Slapper is a pianist and producer, who has worked with David Bowie (see pic below), Boy George, Marc Almond, Holly Johnson, Jarvis Cocker, Lisa Stansfield, Stereo MCs, Alabama 3, Suggs, Angie Brown, Gary Kemp and many others. 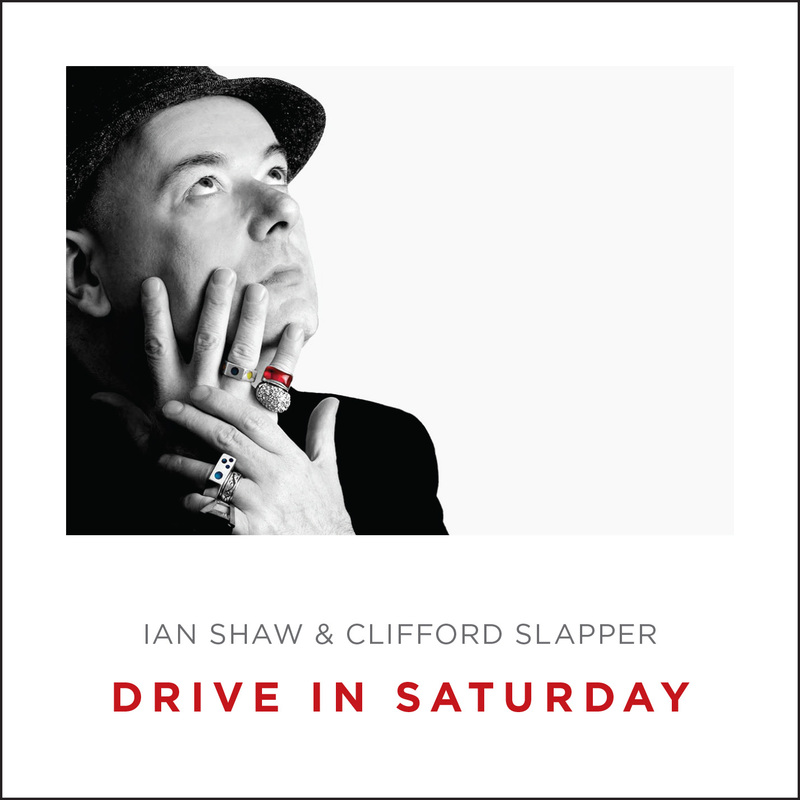 Always inspired throughout his career by the work of David Bowie, Slapper worked closely with Bowie as pianist on his last ever television appearance, in 2006. Since early in 2015 he has been working on producing an album of acoustic covers of Bowie songs arranged by him purely for voice and piano. These unplugged interpretations get to the heart of Bowie’s masterpiece songs through stripping them down and laying bare the emotion in them, like modern torch songs. 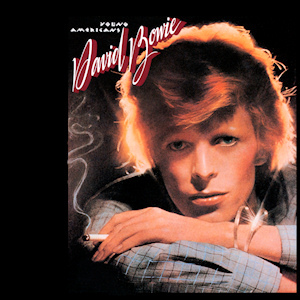 On the album he accompanies on piano about ten varied but stunning singers, each reinterpreting a different Bowie song. "I really loved your piano. Reminded me of Nicky Hopkins and Leon Russell." Tony Visconti, one of the world's greatest producers and David Bowie's friend and producer/performer on numerous Bowie albums, 1969-2016. "Very nice work on that Marc Almond track...you were the standout, for sure." Mark Plati, producer/performer/mixer with David Bowie, 1996-2003. Amongst the vocalists are eg DAVID MCALMONT (of McAlmont & Butler) singing “Sweet Thing”, BILLIE RAY MARTIN (Electribe 101, “You Loving Arms”, The Opiates) singing “After All” and MARCELLA PUPPINI (The Puppini Sisters, Marcella & The Forget Me Nots) singing “Stay”. There are several other superb singers - see the list here. We are also talking with other singers and adding further songs. Recording has been at Trinity Studio, Greenwich and mastering by Pete Maher (U2, The Killers, Jack White, Noel Gallagher, The Rolling Stones, Lana Del Rey). "Linda and I first met in Düsseldorf last year. Prior to that she had been little aware of Bowie’s songs. I felt something about her would respond to this early gem of a song by Bowie. She quickly found the deep emotions in these lyrics and conveyed them in such a heart-wrenching and beautiful way. Primarily a classical and opera singer, she has the versatility to make her mark across all genres, and is a joy to work with. Her voice can be exceptionally powerful, emotive and tender all at once. Another reason for including this song is that it is the favourite Bowie song of Ricky Gervais, on whose show, Extras, I had the pleasure of working with David Bowie, and I dedicate this recording to Ricky!"